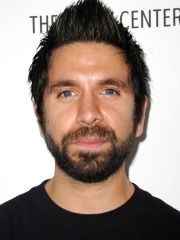 Joshua Eli Gomez is an American actor best known for his role as Morgan Grimes on Chuck. He is the younger brother of actor Rick Gomez. Gomez appeared in a recurring role in the CBS series Without a Trace as computer tech James Mackeroy. He also appeared in a series of IBM commercials, a series of Wendy's commercials , and a commercial for Garmin. He also made a cameo on Freddy's Nightmares. He played Sammy Stinger in Bring It On Again, 2004. As a voice actor, Gomez played Baralai in the video game Final Fantasy X-2, opposite his brother Rick's character, Gippal, and as Parker in Turok. He also had a small part at the beginning of BioShock as Johnny. In September 2007, he began starring in the NBC series Chuck as the title character's friend, Morgan Grimes. Gomez is friends with Chuck co-star, Zachary Levi, in real life. Whole or part of the information contained in this card come from the Wikipedia article "Joshua Gomez", licensed under CC-BY-SA full list of contributors here.